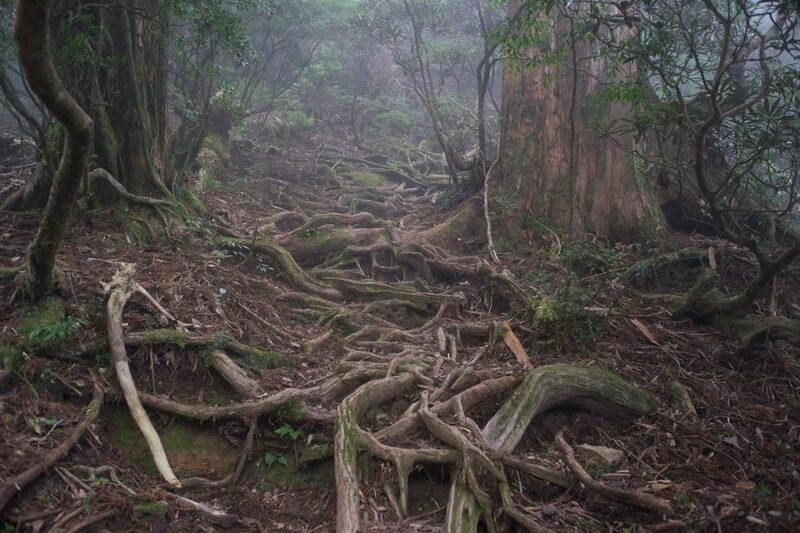 This post is part two of two about hiking the Yakushima traverse in Japan, for part one go here. After waking up to a little bit of sun peeking through the trees, we had breakfast and started to pack up. The tent was wet from the inside due to condensation and there was no way it was going to dry out in the humid climate, especially with the forest blocking out the direct sunlight. At least it wasn’t raining. At around 7:45am the first day hikers arrived at the Ohokabu (大株歩道入口) coming up from the Arakawa Trial Head (荒川登山口) and said hello while we had a coffee. The day was going to be long so we finished everything up quickly and left at 8:15. 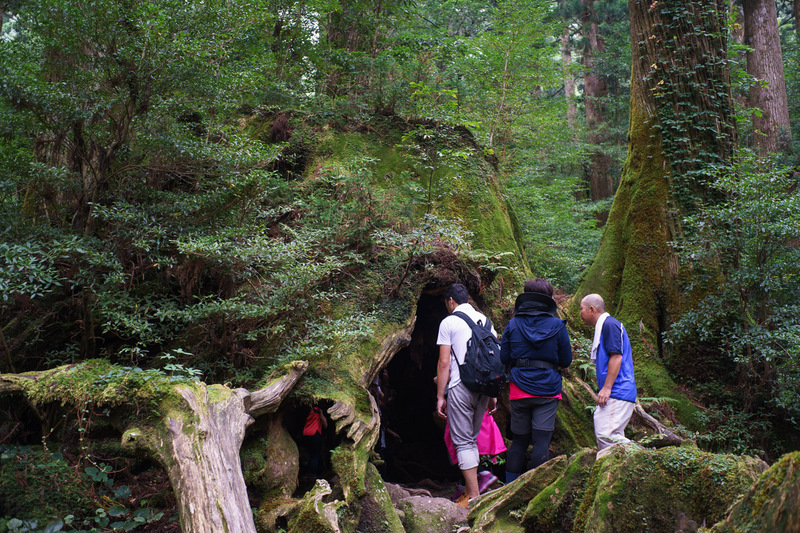 After 30mins we arrived at the famous Wilson Stump (ウィルソン株), which is Cedar tree stump so large that you can go inside! 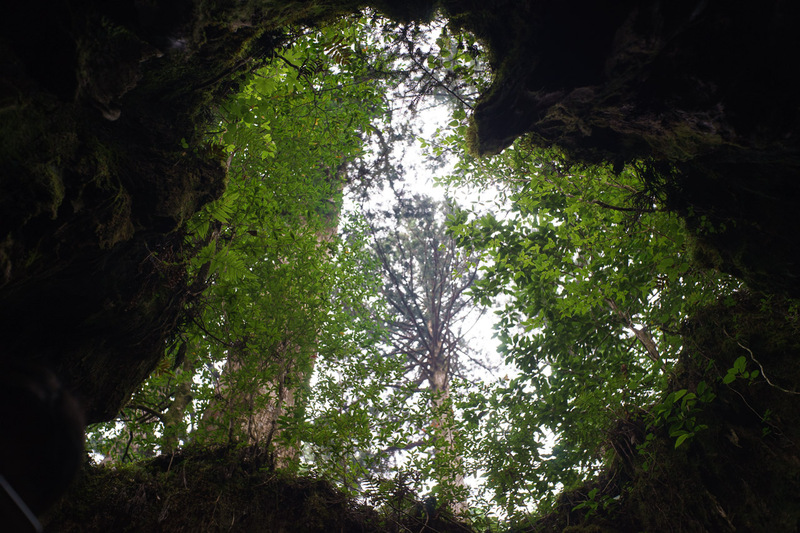 Special about the Wilson Stump is the shape of the cavity in the stump, it is shaped like a rather perfect heart and thus very popular in Japan! Apparently, most Japanese people have seen the stump’s shape at some point on TV. This two part series will give an overview over hiking the Yakushima traverse in late summer (beginning of September) in 2017. Part 2 can be found here. 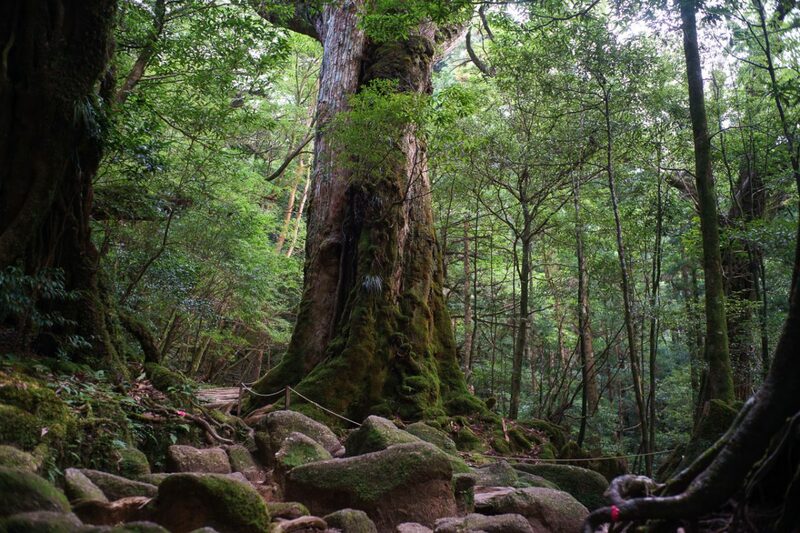 Yakushima itself is an island in southern Japan (south of Kyushu) and a part of the Kagoshima prefecture. So consider this to be an excourse from Hokkaido ;)! There are no more active volcanos on Yakushima but still plenty of (amazing, seaside) onsen around. 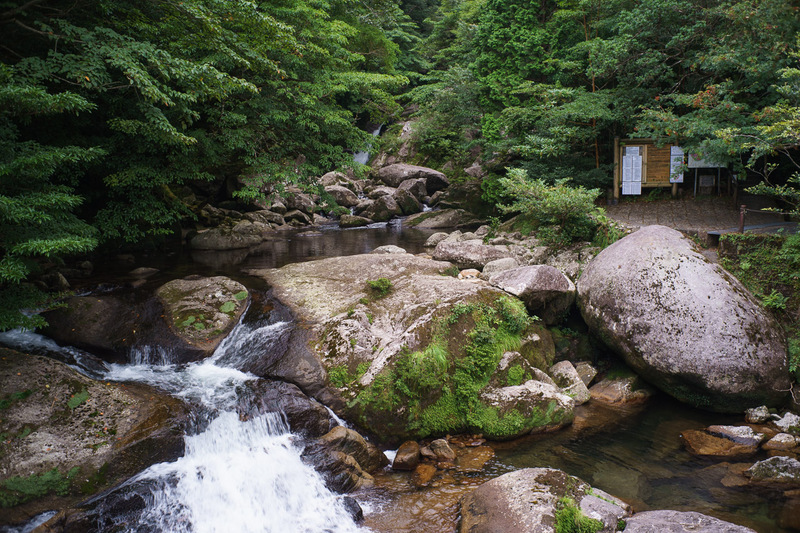 The Yakushima traverse hike is the grandfather of the hiking routes on the island but multiple variations of the route are possible. We decided on the route starting at Shiratani Unsuikyo, passing Jomon Sugi, climbing Mt. Miyanoura and finishing at Yodogawa. Furthermore, we aimed at bringing the least amount of gear possible with us to keep our pack weight low. However, as it was the first attempt we kind of failed and brought too much of all types of items (food, clothes, misc stuff that “might” be needed). 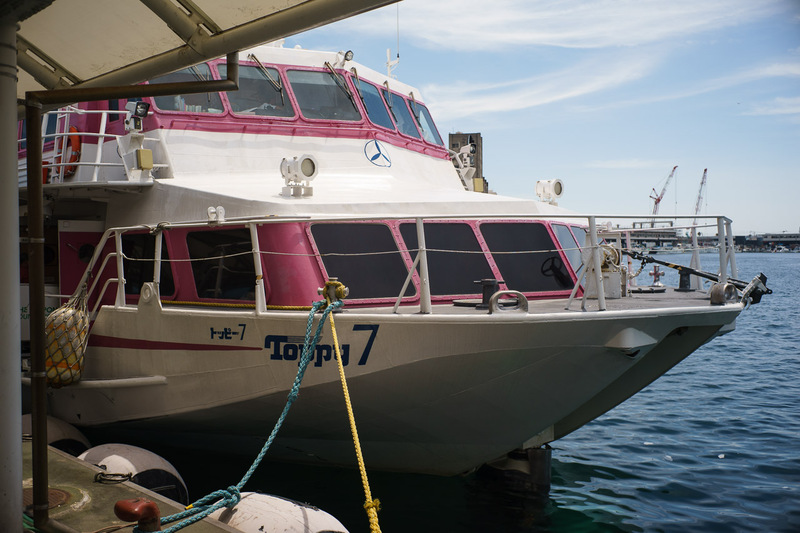 We landed at the northern Miyanoura Port (宮之浦港) at 13:50 by high speed ferry from Kagoshima (depature 12:00), which was a little bit late in hindsight. A note on Kagoshima port: you can leave your car at one of the public parking lots near the ferry terminal for a fee. Then we took the bus at 14:00 from the port directly to the northern trail head Shiratani Unsuikyo (白谷雲水峡) which took around 45mins. The trail head is at an altitude of 600m and lots of day tourists were coming back from a hike around the massive Cedar trees close to the trail head, such as the Yayoi Sugi. At the entrance, you have to pay 2000JPY per person if you indent to sleep within the National Park (same for Hut and Tent) and fill out a hiking iternary, in case of emergency. Strangely enough, after asking I was told that we don’t need to fill out a similar sheet upon completion of the hike. At that point we hadn’t decided yet if we were going to stay at the Shiratani Hut (白谷小屋) or walk further so we left both options on the sheet.